The species Xanthomonas translucens encompasses a complex of bacterial strains that cause diseases and yield loss on grass species including important cereal crops. Three pathovars, X. translucens pv. undulosa, X. translucens pv. translucens and X. translucens pv.cerealis, have been described as pathogens of wheat, barley, and oats. However, no complete genome sequence for a strain of this complex is currently available. A complete genome sequence of X. translucens pv. undulosa strain XT4699 was obtained by using PacBio long read, single molecule, real time (SMRT) DNA sequences and Illumina sequences. Draft genome sequences of nineteen additional X. translucens strains, which were collected from wheat or barley in different regions and at different times, were generated by Illumina sequencing. Phylogenetic relationships among different Xanthomonas strains indicates that X. translucens are members of a distinct clade from so-called group 2 xanthomonads and three pathovars of this species, undulosa, translucens and cerealis, represent distinct subclades in the group 1 clade. Knockout mutation of type III secretion system of XT4699 eliminated the ability to cause water-soaking symptoms on wheat and barley and resulted in a reduction in populations on wheat in comparison to the wild type strain. Sequence comparison of X. translucens strains revealed the genetic variation on type III effector repertories among different pathovars or within one pathovar. The full genome sequence of XT4699 reveals the presence of eight members of the Transcription-Activator Like (TAL) effector genes, which are phylogenetically distant from previous known TAL effector genes of group 2 xanthomonads. Microarray and qRT-PCR analyses revealed TAL effector-specific wheat gene expression modulation. PacBio long read sequencing facilitates the assembly of Xanthomonas genomes and the multiple TAL effector genes, which are difficult to assemble from short read platforms. The complete genome sequence of X. translucens pv. undulosa strain XT4699 and draft genome sequences of nineteen additional X. translucens strains provides a resource for further genetic analyses of pathogenic diversity and host range of the X. translucens species complex. TAL effectors of XT4699 strain play roles in modulating wheat host gene expressions. Bacterial pathogens of the genus Xanthomonas cause disease symptoms in a wide range of plant species, including many economically important cereal crops . The species X. translucens represents a complex of strains that are pathogenic on various members of the Poaceae, including wheat, barley, oat, rye and other grass species. Bacterial leaf streak (BLS) and black chaff symptoms in the grain spikes on wheat are caused by X. translucens pv. undulosa strains. Outbreaks of BLS occur sporadically in central Great Plains and are associated with relatively warm and humid conditions, although the disease has been prevalent in recent recurrent years in the northern Great Plains . X. translucens strains have been classified by pathogenicity types and DNA fingerprinting technologies . Strains causing disease symptoms on barley and wheat are named as X. translucens pv. undulosa, while strains only pathogenic on barley are called X. translucens pv. translucens . Although some strains of X. translucens pv. cerealis behave similarly as X. translucens pv. undulosa in pathogenicity types, they are distinguishable by DNA fingerprinting . Phylogenic analyses of various X. translucens, do not align with the pathovar designations, and clarifications await genomic analyses on larger strain collections. In addition, many strains that were isolated from other species, often have been reported to cause disease symptoms on wheat . For example, thirty-three bacterial strains isolated from diseased ornamental asparagus were identified as X. translucens pv. undulosa using DNA fingerprinting and cross inoculation . Next-generation sequencing technologies have made transformational changes over the Sanger sequencing by improving throughput and reducing cost [6, 7]. The draft genome sequences provide valuable information on major genome contents and enable genome comparison among strains of interest [8, 9]. Currently, draft genome sequences are available for four strains from the X. translucens group. Draft genomic data for X. translucens pv. undulosa strain DAR61454, X. translucens pv. transluencs strain DSM18974, X. translucens pv. cerealis CFBP2541, and X. translucens pv. graminis ART-Xtg29 were generated by using Illumina or Roche 454 short read sequencing platforms [8–10]. At the same time, genome assemblies based on Illumina and Roche 454 sequencing are fragmented, and most assemblies failed to assemble complex repetitive sequences, including Transcription Activator-Like (TAL) effector genes, which occur in multiple gene copies and contain multiple simple near-perfect repeats within each gene. TAL effector genes typically have highly conserved N- and C-terminal sequences, and harbor 12.5–28.5 units of 102 or 105 bp repeats in the central regions . Recently, a single-molecule real-time (SMRT) sequencing technology was developed by Pacific Bioscience (PacBio) and produces long sequence reads with no obvious sequencing biases and may allow better resolution of long repetitive DNA features in a genome. Due to a high error rate of PacBio reads, a high sequencing depth (e.g., 50× or higher) is usually required for a high-quality de novo assembly [11–13]. In this study, the complete genome sequence of X. translucens pv. undulosa strain XT4699 was generated by using high-depth PacBio and Illumina data. The genome was compared to draft genomic sequences of nineteen additional X. translucens strains that were derived by Illumina. Comparisons of TAL effectors from three X. translucens strains and their relationship with TAL effectors from other Xanthomonas species were also performed, and evidence for TAL effector-dependent effects on host gene expression was assessed by microarray and qRT-PCR analyses. Illumina 2x250 bp MiSeq data for XT4699 provided approximately 60x coverage, comprising 267.5 Mbp total sequencing bases. The assembly via SOAPdenov2 resulted in 547 contigs of at least 400 bp in length. The total assembly length was 4.4 Mb and the N50 equals to 15,114 bp. Two PacBio SMRT cells of 10-kb library preparation for XT4699 generated 114,394 raw reads and a total of 446 Mb. The average length of reads was 3,898 bp. The reads were assembled into two long contigs using an optimized assembly pipeline, HGAP2 . The longest contig is 4,357,621 bp in length. Two contigs were merged into a single contig via combining with Illumina assembled contigs using the minimus2 module in AMOS (sourceforge.net/apps/mediawiki/amos). Alignments of PacBio raw reads to the resulting single contig identified multiple PacBio reads spanning the junction of two original Pacbio contigs, providing additional evidence for the contig merging. Two ends of the resulting single contig shared 8,439 bp with 99.33 % identity. The contig was circularized after removing the sharing sequence at one end. The circularized assembly draft was subjected to an additional two rounds of error correction using the PacBio resequencing pipeline that includes the error correction module . Consequently, a single finished genome sequence (N = 4,561,137 bp) was obtained (Fig. 1). To assess the assembly quality, Illumina reads were mapped to the assembled sequence. 99.53 reads can be mapped and 95.46 % are uniquely mapped with the stringent mapping criteria (see Methods). Respectively, 99.99 and 99.44 % of the assembled genome was covered by mapping reads and uniquely mapped reads. Based on the alignments, no mismatches were identified between reads and the assembled genome (see Methods), indicating the high quality of the assembly sequence. The Illumina-only assembly contigs were also aligned via nucmer  to the final assembly, and approximately 97 % of the final assembly was covered by the Illumina contigs. Of the 547 contigs, 98.54 % (539/547), accounting for 99.77 % total contig sequence, can be aligned to the sequence with four exceptions (see Methods). Four single nucleotide variants, including two substitutions and two INDELs (insertion-and-deletions), were identified between the Illumina assembly contigs and the final assembly (Additional file 1: Table S1). To assess the quality of the assembly in the repetitive regions, the eight TAL effector genes were cloned by high fidelity PCR and sequenced using the standard Sanger protocol. All the Sanger sequences were perfectly matched to the assembled genome sequence with 100 % identity (Additional file 2: Table S2). The XT4699 genome is a single circular chromosome (4,561,137 bp) with an overall G + C content of 68.1 %. The complete genome, as annotated by the NCBI Prokaryotic Genome Automatic Annotation Pipeline (PGAAP), contains 3,528 coding DNA sequence (CDS) genes, 94 pseudogenes, and 54 genes with frameshift mutation that alters open reading frame. XT4699 has 2 ribosomal RNA operons and 54 tRNA genes. The genome contains 74 predicted insertion sequence (IS) elements and 56 partial IS elements using the ISfinder program (Table 1). The genome encodes three long non-ribosomal peptide synthesis (NRPS) proteins of 4827, 7451, and 6419 amino acids, respectively, in a cluster of 80 kb regions flanked by IS elements (Fig. 1). A plant inducible promoter (PIP) element is present in 49 genes, including some type III secretion system (Hrp) and effector genes (Fig. 1, Additional file 3: Table S3). The XT4699 genome consists of 4.3 %, or approximately 0.2 Mb, of repetitive sequence. Among 252 genomic repetitive regions, 163 repeats are less than 1 kb and 89 repeats are longer than 1 kb. The longest repeats, located around FD63_00725 and FD63_01915 ribosome RNA genes, are approximately 6 kb with the 99.98 % identity between two copies. Eleven pairs of tandem repeats were identified, ranging in size from 107 to 537 bp. In terms of copy number, 42.5 of the repeats have two copies and 57.5 % repeats have three or more copies. Tandem repeats and high copy repeats (>2) increase the complexity of the assembly. In the Illumina-based assembly, more than 90 % of the tandem repeats occurred at assembly gaps, even when relatively short (115–375 bp), and the vast majority of high-copy repeats were not resolved. With one exception, repetitive regions with length greater than 500 bp were not resolved in the Illumina-based assembly. Overall, 40 % of the gaps in the Illumina-only assembly were located at repetitive regions. The overall GC percentage of the XT4699 final assembly is 68.1 %, while the overall GC percentage of the Illumina-only assembly is 67.2 %, indicating GC-rich regions are not equally represented in the Illumina-based assembly. To assess Illumina and PacBio sequence results for GC-rich regions, the final assembly genome was scanned with non-overlapping 200 bp windows, and the GC% and sequencing coverage of both Illumina and PacBio sequences were determined at each window. Scatter plots showed a GC bias in sequencing coverage of Illumina but not PacBio, which at least partially explains high variation of Illumina sequencing coverage and uniform distribution of PacBio sequencing reads across the genome (Additional file 4: Figure S1). The vast majority (50/55) of extremely high GC regions, which exhibit > 80 % GC content, overlap with assembly gaps in the Illumina-only assembly. Most gaps on GC rich regions are very small (<100 bp). The flanking contigs of many of these gaps have overlaps, but the overlapping sequences between two adjacent contigs are not long enough to join them. On the contrary, gaps caused by repeats are generally longer than GC-rich gaps. The sizes of repeat-induced gaps are linearly correlated with repeat sizes (Additional file 5: Figure S2). Regardless of gaps in the Illumina-only assembly, the contig sequences exhibit high accuracy when compared with the final assembly (Additional file 4: Figure S1). Genome assembly using Illumina 2x250 bp reads for other 19 X. translucens strains was performed with contigs having 70–200x coverage. The N50, assembled genome size, maximum contig length, and contig number of each assembly are shown in Table 2. Consistent with the classification results from previous studies [8, 9], multilocus sequence analysis (MLSA) revealed the X. translucens strains were closer to X. albilineans in xanthomonad group 1 than X. oryzae and X. campestris in group 2 (Fig. 2a). The X. translucens pv. undulosa strains, XT4699, XT-Rocky, LB10, P3, LG48, and DAR61454, which are all virulent on both wheat and barley, were separated from the X. translucens pv. translucens strains XT8, B1, B2 and DSM18974, which are only virulent on barley. In addition, the above strains were distinguishable from the X. translucens pv. cerealis strains CFBP2541 and XT123, and X. translucens pv. graminis ART-Xtg29, which is consistent with previous phylogenetic classifications based on AFLP analysis . The phylogenetic tree developed by a whole genome SNP comparison further corroborated MLSA results, providing higher resolution of evolutionary relationship among closely related strains (Fig. 2b, Additional file 6: Table S4). Strains LG54, XT5523, XT-Rocky, CS2, CS22, LB10, and DAR61454 are highly related, although they were isolated from different geographic origins and at different times (Table 2). The strains have near identical housekeeping genes, ranging from 2 to 17 SNPs in individual strains out of a total of 9,836 SNPs among the strains (Additional file 6: Table S4). XT4699 and LG48 are another pair of highly related strains on the basis of MLSA and the whole genome SNP comparison (Fig. 2). Based on previous pathogenicity tests, X. translucens strains have been grouped into type A, pathogenic on both wheat and barley, type B, only pathogenic on barley, and type C, not pathogenic on either . Though strains from X. translucens pv. undulosa and X. translucens pv. cerealis are classified as pathogenicity type A, they are distant in the phylogenetic relationship (Fig. 2). Here, cultivars other than ‘Alondra’ wheat and ‘Corona’ barley were tested to determine possible pathogenicity differences between strains from each subgroup. Three representative strains, XT4699 (X. translucens pv. undulosa), XT8 (X. translucens pv. translucens) and XT123 (X. translucens pv. cerealis), from each subgroup were selected and inoculated on ‘Chinese Spring’, ‘Jagger’, ‘Hope’ and ‘Canthatch’ hexaploid wheat, one Triticum turgidum wheat (accession number 107 in WGRC at Kansas State University), ‘KS Southeast’ and ‘Morex’ barley. XT4699 induced water-soaking symptoms on ‘Chinese Spring’, ‘Jagger’, ‘Hope’, ‘Canthatch’ wheat and ‘KS Southeast’ barley, while inducing mixed symptoms of chlorosis and water soaking on ‘Morex’ barley. XT123 only triggered chlorosis symptoms at 4 DPI on ‘Chinese Spring’, ‘Jagger’, ‘Hope’ wheat and ‘KS Southeast’, and ‘Morex’ barley (Additional file 7: Figure S3). Though XT123 could cause water-soaking on ‘Canthatch’ and Triticum turgidum wheat cultivars, the strain exhibited different lesion symptoms from XT4699 (Additional file 7: Figures S3F and S3G). XT8 caused strong water soaking symptoms on ‘KS Southeast’ barley and less severe water soaking lesions on ‘Morex’ barley, while only inducing chlorosis on all the wheat cultivars (Additional file 7: Figure S3). Clustered regularly interspaced short palindromic repeat (CRISPR) and CRISPR-associated genes (Cas) comprise an adaptive bacterial immune system against foreign DNA . The spacer sequences between repeats in the CRISPR loci typically correspond to sequences of perfect copies, called proto-spacer, of sequences in foreign DNA elements and direct the their cleavage . The sequencing and monitoring of repeat and spacer array of CRISPR in strains provides insight into the coevolution relationship between strains and invader phage DNA. The DNA elements of CRISPR loci contain a record of past immunity events and can reveal relationships between closely related strains and populations [17, 18]. Genomic sequence data of the X. translucens strains in this study and previously sequenced strains revealed CRISPR loci are present in most X. translucens strains, except for XT4699, LG48, and XT123. If present, only one CRISPR locus is found in each strain. The CRISPR loci are often flanked by transposon gene elements. Annotation of CRISPR Cas genes of all X. translucens strains and X. oryzae pv. oryzae strain PXO99 indicates that the strains belong to the Type I-C (Dvulg or CASS1) in the classification of CRISPR-Cas systems . The phylogenetic relationship, based on the nucleotide sequences of Cas gene clusters, among these strains is different from the MLSA and whole genome SNP comparisons (Fig. 2, Additional file 8: Figure S4), suggesting the evolution of CRISPR-Cas system is somewhat independent of genome evolution. LW16 and CS4 strains are special variants in this subtype, harboring two Cas3 helicase genes, while other strains only have one. The sequence of direct repeats in the CRISPR loci is conserved among X. oryzae pv. oryzae strain PXO99 and X. translucens strains, although CRISPR Cas loci are distinct. The comparison of spacer elements among strains revealed that X. translucens pv. undulosa and X. translucens pv. translucens have distinct spacers, with the exception that X. translucens pv. undulosa strain P3. P3 shares twenty-three identical spacers with X. translucens pv. translucens strain B1, while harboring no identical spacer element with any other X. translucens pv. undulosa strain. Strains P3 and B1, though distinct in phylogeny and pathogenicity types, may have experienced an overlapping history of immunity or, alternatively, the strains have acquired the CRISPR elements by lateral gene transfer. X. translucens pv. translucens strains XT8 and B2 have closely related CRISPR Cas loci and share fifty-five identical spacers (Fig. 3a, Additional file 8: Figure S4). LW16 and CS4 share thirty-two identical spacers, the highest observed among X. translucens pv. undulosa strains (Fig. 3b). Although the older spacer elements in the X. translucens strains are shared among some strains, the most recently acquired spacer sequences are unique to each strain. (Fig. 3). However, nine strains, XT-Rocky (collected from KS in 2009), XT5523 (collected from Canada in 1966), LG54, CR31, CS2, CS22, LB5, LB10 (collected from ND in 2009) and DAR61454 (collected from Australia in 1988), share identical elements of Cas cluster, repeats, and spacer array (Fig. 3b), implying that CRISPR Cas loci can be maintained over decades. The spacer sequences of X. translucens pv. cerealis CFBP2541 and X. translucens pv. graminis ART-Xtg29 strains were not detected in any other X. translucens strains. Comparative genomics have previously revealed extensive divergence of the type III secretion system (T3SS) between group 1 and group 2 of Xanthomonas species . X. albilineans does not possess the T3SS, which is usually present and crucial for pathogenicity in group 2 Xanthomonas species . Disruption of the T3SS in X. translucens pv. graminis strain ART-Xtg29 did not eliminate disease symptoms, and the survival of T3SS mutants inside of plant tissue was reported to be unaffected when compared to the wild type strain up to 14 days post infection (DPI) . The T3SS gene clusters in XT4699 and ART-Xtg29 strains are syntenic but have lower sequence identity in T3SS proteins compared to the identity between X. translucens pv. undulosa strains (Additional file 9: Figure S5). An insertion mutant of the conserved component gene hrcC in XT4699 (XT4699hrcC − ) resulted in loss of disease symptoms on ‘Chinese Spring’ wheat on the basis of water-soaking lesions, which were not visible by 10 DPI in the mutant, while wild type XT4699 caused extensive water-soaked lesion starting at 3 DPI (Fig. 4a). Re-introduction of the native hrcC gene into the mutant strain fully complemented the loss of disease symptoms (Fig. 4a). Using an alternative dip inoculation assay, no disease was present 10 DPI for XT4699hrcC − , while the disease spots appeared at 4–5 DPI for the XT4699 (Fig. 4b). The ability to cause disease symptoms on barley was also lost in XT4699hrcC − . Two different barley cultivars, ‘KS Southeast’ and ‘Morex’, were used in the inoculation assays. XT4699 formed sharply delineated water-soaked lesions and a mixed symptom of chlorosis and water soaking at 3 DPI on ‘KS Southeast’ and ‘Morex’, respectively, while XT4699hrcC − failed to develop symptoms on either cultivar (Additional file 7: Figures S3B and S3C). In addition, XT4699hrcC − failed to trigger a hypersensitive reaction (HR) and strong chlorosis on non-host KY14 tobacco, while the XT4699 and the hrcC − complementation strains did induce an HR (Fig. 4c). Bacterial population assays in ‘Chinese Spring’ wheat indicated that the XT4699hrcC − population was lower by approximately 450 fold in comparison to XT4699 at 6DPI (Additional file 10: Figure S6). Thirty-nine putative type III effectors (T3Es) genes were predicted from the genomic data, not including TAL effector genes, from diverse X. translucens strains (Fig. 5). Among them, twenty-three T3Es are conserved among the X. translucens pv. undulosa, X. translucens pv. translucens, and X. translucens pv. cerealis. The core set of T3Es includes AvrBs2, XopF, XopK, XopL, XopN, XopP, XopQ, XopR, XopX and XopZ, with the exception of two X. translucens pv. cerealis strains, which have frameshift mutation in XopR. Multiple copies of avrBs2, xopF, xopX, xopL and xopP are found in all three X. translucens pathovars, while strains from group 2 Xanthomonas species only harbor one. Effector composition varies between different and within pathovars. The presence and absence, copy number difference, and frameshift in coding sequences of T3E genes were observed (Fig. 5). The gene avrBs1 is present in only X. translucens pv. undulosa strain CS4 and both X. translucens pv. cerealis strains. The xopJ1 effector gene is present in XT5523, XT-Rocky, XT5770, and DAR61454, but absent in XT4699, LG48, LW16, and XT5791. The gene xopJ1 is present in all four X. translucens pv. translucens strains but not in either of X. translucens pv. cerealis strains. The xopAH and xopAK genes are present in all X. translucens pv. undulosa and X. translucens pv. translucens strains but not in either of X. translucens pv. cerealis strains. Five different xopE effector genes are present in the four pathovars. All X. translucens pv. undulosa strains have xopE1 and xopE5, and X. translucens pv. translucens strains harbor xopE2 and xopE3, while X. translucens pv. cerealis strains have xopE1, xopE2 and xopE5. The X. translucens pv. graminis strain Xtg29 has xopE1, xopE2 and xopE4. Besides the difference on the presence and absence of T3Es, variability in gene copy number exists among pathovars or within a pathovar. Two xopAF in X. translucens pv. undulosa strains DAR61454, XT-Rocky, XT5523, and XT4699, but only one copy in X. translucens pv. undulosa strains LW16, CS4, and XT5791. All four X. translucens pv. translucens strains have two copies of xopAF, while X. translucens pv. cerealis strains harbor one. Two copies of xopL are present in all X. translucens pv. undulosa and X. translucens pv. translucens strains, while there are four copies in X. translucens pv. cerealis strains. Two copies of xopP are present in X. translucens pv. undulosa strains, and three copies in X. translucens pv. translucens and X. translucens pv. cerealis strains with the exception that X. translucens pv. translucens strain B1 only has two xopP genes Four X. translucens pv. undulosa strains have frameshift mutations in one xopP. Consistent with a previous study on T3E genes in X. axonopodis pv. manihotis , frameshift mutations of T3Es is not rare in X. translucens strains. Frameshifts in the coding sequence of one avrBs2 is present in X. translucens pv. undulosa strain P3. Two X. translucens pv. cerealis strains have frameshift mutations in xopR compared to X. translucens pv. undulosa and X. translucens pv. translucens strains. All four X. translucens pv. translucens strains harbor frameshift mutations in xopAP compared to X. translucens pv. undulosa and X. translucens pv. cerealis strains (Fig. 5). Eight TAL effector genes were identified in XT4699. The number and lengths of TAL effector genes of XT4699 were confirmed by DNA Southern hybridization, in which the size of BamHI fragments with TAL effector genes was consistent with the size of blotted bands (Additional file 11: Figure S7). Moreover, Sanger sequences of all eight TAL effector genes cloned by PCR with high fidelity polymerase were identical to the sequences of corresponding TAL genes in the assembly genome of XT4699 (Additional file 2: Table S2). Four TAL effector genes from strain XT-Rocky were cloned and sequenced. Alignment of the predicted TAL effector proteins as represented by the repeat variable di-residues (RVDs) indicated that all the four of the TAL effectors that were retrieved from strain XT-Rocky were identical to corresponding TAL effectors from XT4699 except XTRocky-3E3 effector had variation in the last 5 RVDs and one RVD in the 7th repeat compared to XT4699-Tal6 (Fig. 6). Two TAL effector genes from the X. translucens pv. cerealis strain CFBP2541 were previously identified . TAL effector genes were not identified in the genome of X. translucens pv. graminis ART-Xtg29 strain . The sequences of all RVDs available from these three strains reveal unusual RVDs, including YD, YK, QD, KG, Y*, NF, KI and GI, which are rarely or not found in X. oryzae and X. campestris strains of group 2 xanthomonads (Fig. 6, Additional file 12: Table S5). In addition, sequences of 32nd-35th amino acids of repeats in TAL effectors in X. translucens are variable. Also, both 34 and 35 amino acids predicted repeats were observed within most individual TAL effectors (Additional file 12: Table S5). XT4699-Tal4 is distant from other TAL effectors in X. translucens based on the phylogenetic relationship of N- and C-terminal amino acid sequences (Fig. 7). TAL effectors in X. translucens strains are more closely to the AvrBs3 and PthXo1 of group 2 xanthomonads than Brg11 in Ralstonia solanacearum GMI1000 (Fig. 7, Additional file 13: Figure S8). The two TAL effectors from X. translucens pv. cerealis strain CFBP2541 are distinct from TAL effectors of X. translucens pv. undulosa strains in both RVD alignment and homology of N- and C-terminal amino acid (Figs. 6 and 7). The XT4699 genome annotation shows that most TAL effector genes are flanked by transposon elements (Additional file 14: Figure S9). Primer pairs used for amplification of the TAL genes in XT4699 were applied for eleven other X. translucens pv. undulosa strains to identify potentially conserved TAL effector genes in X. translucens pv. undulosa. PCR fragments with similar sizes to tal7 of XT4699 were present in 7 of 11 strains and sequencing of four representative genes showed the same RVDs as XT4699-Tal7 except for one amino acid variation in corresponding TAL effectors of both CS4 and LB5 (Fig. 6, Additional file 15: Figure S10). Microarray analyses of gene expression from wheat leaf samples that were inoculated with strains XT4699, XT-Rocky, and XT4699hrcC − were performed to identify changes in host gene expression associated with pathogenicity. Gene expression profiles upon inoculation of wheat cultivar ‘Chinese Spring’ with strains XT4699 and XT4699hrcC − mutant were found to be distinct from each other, revealing approximately 250 genes with at least a 10-fold difference of expression (Additional file 16: Table S6). Mutations were generated in TAL effector genes of XT4699 (Additional file 17: Figure S11), and analysis of host gene expression after inoculation of each TAL effector gene mutant revealed three differentially induced genes, corresponding to Affymetrix probes Ta.7291.1.S1_s_at, Ta.14824.1.S1_at and Ta.9765.1.S1_at, selected from the microarray analysis of XT4699 vs XT4699hrcC − comparison (Additional file 16: Table S6), were not induced during infections of mutants M2 (tal6 − ), M3 (tal7 − ) and M4 (tal1 − ), respectively (Additional file 18: Figure S12). The probes sets Ta.7291.1.S1_s_at, Ta.14824.1.S1_at and Ta.9765.1.S1_at corresponded to coding regions that were predicted to encode a succinate dehydrogenase subunit, a choline transporter related protein and a cell wall invertase, respectively. Two genes from the microarray analysis, corresponding with to probes Ta.7291.1.S1_s_at and Ta.14164.1.S1_x_at, were induced by infection with wild type XT4699 but not by strain XT-Rocky (Additional file 16: Table S6). M2, a mutant of tal6, failed to induce Ta.7291.1.S1_s_at (Fig. 8a, Additional file 18: Figure S12) and Ta.14164.1.S1_x_at, which is predicted to encode a bHLH family transcriptional factor (Fig. 8b). Comparison of RVDs of TAL effectors between XT4699 and XT-Rocky revealed one TAL effector, XTRocky-3E3, is highly similar to XT4699-Tal6 but has variations in 6 RVDs (Fig. 6). The qRT-PCR assays indicated these two genes were not induced by X. translucens pv. translucens XT8, X. translucens pv. cerealis XT123 or X. translucens pv. undulosa XT5523 (the latter being very close to XT-Rocky in phylogeny). The two genes were elevated in expression after infection of plants by three other X. translucens pv. undulosa strains (Additional file 19: Figure S13). Complementation of the M2 mutant with tal6 resulted in restored expression of both genes (Fig. 8a and b). The transcriptional induction of the two genes by XT4699 occurred in the presence of the eukaryotic translation inhibitor cycloheximide (CHX) (Fig. 8c and d), which had been used for distinguishing direct or indirect target of TAL effectors from Xanthomonas strains in previous study [22, 23]. A complete genome assembly provides an excellent foundation for further genetic and comparative analyses into the pathogenicity mechanisms of a pathogen. The advances of genome sequencing technologies and better assembly algorithms now facilitate assembly of genomes with highly repetitive regions . In this study, a complete genome sequence was generated for X. translucens pv. undulosa strain XT4699. The results demonstrated that PacBio data was sufficient to achieve a high-accuracy assembly of a bacterial genome with many IS elements and multiple copies of highly repetitive TAL effector genes. Intact sequences of TAL effector genes can be used to predict the potential targets in host genomes, thereby facilitating the identification of possible resistant or susceptible genes [25, 26]. Draft genome sequence data was also generated using Illumina short reads for 20 strains, including XT4699, to determine the relatedness and compare effector contents among them. The comparison between the XT4699 Illumina-only assembly and the complete XT4699 assembly shows that approximately 97 % the complete genome is covered by the Illumina-only assembled contigs. The characterization of assembly gaps on the Illumina-only assembly indicates that gaps are largely located at repetitive regions and high GC contents. The lengths of gaps at repetitive regions tend to be linearly correlated to repeat lengths while the gaps at high GC regions are typically small. Gaps due to a high GC content may, in the future, be reduced by using a new Illumina PCR-free library preparation protocol, which is expected to ameliorate amplification biases associated with high GC contents. TAL effector gene content was not resolved in the Illumina draft genome sequences. To resolve repeats, especially long and complex repeats, PacBio or other emerging long read sequencing technologies are needed [27, 28]. The improvement of these long read sequencing technologies may dramatically reduce the sequencing cost per bacterial strain in the near future. The ability to sequence and completely assemble a large number of independent strains would greatly accelerate genome comparison and the identification of bacterial virulence factors. Although not examined here, PacBio sequence can also be used to characterize the methylomes of bacteria and enables the exploration of possible epigenetic features in bacterial gene expression and restriction modifications . The comparison of type III effector (T3E) content in X. tranlucens strains identified both conservative (N = 23) and variable T3Es among three pathvors, X. translucens pv. undulosa, X. translucens pv. translucens and X. translucens pv. cerealis. Effector triggered immunity (ETI) is defined by T3S/R gene pairs, which are present in the pathogens and host plants, respectively [30, 31]. Highly conserved sets of T3Es provide a potential opportunity to deploy pyramided R genes for broad resistance to the bacterial leaf streak disease, although no T3Es-specific R genes are known in wheat at this time. Presence and absence variation, copy number variation, and frameshift mutations were all observed in T3Es among X. translucens strains, and TAL effector repertories are also highly variable. The X. translucens pv. cerealis strain CFBP2541 only contains two TAL effectors, sharing no similarity with TAL effectors from X. translucens pv. undulosa strains based on the RVD sequences. Variation in T3Es may be one factor accounting for pathogenic diversity and host range determinants of X. translucens strains. Pathogenic and genetic diversity are present in X. translucens strains collected from five different locations in North Dakota , and host specific virulence genes have been reported to act as host range determinants [32, 33]. CFBP2541 (X. translucens pv. cerealis) is a phylogenetically close strain to XT123 (X. translucens pv. cerealis) and was reported to cause severe symptoms on ‘Morex’ barley . XT123 only induced chlorosis on ‘Morex’ barley. However, pathogenicity diversity among different X. translucens strains may also be derived from variation in other genetic elements related with bacterial fitness. Functional mutation and complementation in genes related with virulence is needed for detecting the virulence contribution of genes and explaining their roles leading to difference in pathogenicity types. The TAL effector triggered susceptibility has been demonstrated in several disease complexes. The TAL effectors are a large family of closely related type III effector proteins, which transcriptionally activate host gene expression by directly interacting with promoter elements of host genes and have a varying degree of contribution in bacterial virulence, proliferation, and other disease symptomatology [34, 35]. So far, TAL effectors with virulence contribution have been detected in strains of X. oryzae pv. oryzae, X. citri pv. citri, X. campestris pv. vesicatoria, X. campestris pv. malvacearum, X. axonopodis pv. manihotis and X. oryzae pv. oryzicola [22, 36–44]. However, it is still an open question whether TAL effectors play roles in triggering susceptibility in bacterial leaf streak on wheat. In this study, we are confirmed that TAL effectors do modulate transcriptional profiling of wheat host. The XT4699-Tal6 effector affects the transcriptional level of two candidate target genes, encoding a bHLH transcriptional factor and a succinate dehydrogenase subunit, respectively. Whether or not they are directly targeted by Tal6 is unknown. Searching in the promoter regions of the two genes using the RVD sequence of Tal6 did not give positive EBE above the default cutoff value (https://tale-nt.cac.cornell.edu/node/add/talef-off). We also failed to detect the direct interaction between Tal6 and 400 bp promoter sequence upstream of translation start site of bHLH gene in the assays of Agrobacteria-mediated transient expression in Nicotiana tabacum KY-14 (data not shown). In this study, no tal mutants suffered an obvious loss of virulence when compared to the WT strain in the bacterial growth population assays (Additional file 10: Figure S6). It is not known if TAL effectors contribute to bacterial virulence in other ways. Previous studies showed AvrBs3 of X. campestris pv. vesicatoria, Tal2g of X. oryzae pv. oryzicola and Avrb6 from X. campestris pv. malvacearum did not affect bacterial growth but had roles in other types of virulence contributions [37, 38, 42]. In this study, XT4699-tal7 was identified as a conserved TAL effector gene among 8 of 12 X. translucens pv. undulosa strains. Cloning and sequencing of TAL effector genes in larger collection of X. translucens strains is needed to get more reliable information regarding with conservation of TAL effector genes. The insertion of DNA elements, specifically designed to be recognized by RVDs of conserved TAL effectors, in the promoter regions of effective R genes was applied for controlling bacterial blight and bacterial leaf streak of rice [45, 46]. Therefore, for controlling the bacterial leaf streak on cereal crops, use of the RVDs of conserved X. translucens TAL effectors may allow the engineering of specific super terminator R genes in cereal crops. Complete genome assembly of repeat laden bacterial genomes can be facilitated by long read sequencing platforms. Genomic comparisons among strains from different pathovars of X. translucens or within one pathovar of X. translucens revealed variations in type III effector repertories, which may explain the pathogenic and genetic diversity of X. translucens strains and might relate with host range adaptations of specific strains [32, 33]. TAL effectors in X. translucens strains are distant from ones of group 2 xanthomonads in phylogeny and RVD sequences. Gene expression studies reveal specific TAL effectors in XT4699 function in modulating expression of specific genes in wheat plants. The X. translucens strains used in this study are listed in Table 2. Xanthomonas strains were grown on tryptone sucrose agar (tryptone, 10 g/l; sucrose, 10 g/l; glutamic acid, 1 g/l; Difco Bacto agar, 15 g/l) medium at 28 °C . Bacterial strains were stored in nutrient broth with 20 % glycerol at −80 °C. For genomic DNA extraction, fresh grown bacteria from medium was washed first by sterilized water and be treated with 1 % SDS and proteinase K (1 mg/ml) at 37 °C for 20–30 min. Samples were then treated with 0.5 M NaCl and incubated at 65 °C for 30 min for cell lysis. Phenol and chloroform extraction and 2.5 times 95 % ethanol precipitation were applied to isolate DNA. Samples were treated with RNase A (0.1 mg/ml) and incubated at 37 °C for 30 min for RNA removal. Bacterial genomic DNAs were subjected to library preparation using the Illumina TruSeq DNA LT Sample Prep kit. 2x250 bp paired-end data for all sequenced strains were generated on an Illumina MiSeq at the Integrated Genomic Facility at Kansas State University. Reads were subjected to adaptor and quality trimming and assembled via CLC Genomics Workbench software, DISCOVAR de novo (ftp://ftp.broadinstitute.org/pub/crd/DiscovarDeNovo/), or SOAPdenov2 . For the whole genome assembly for XT4699 strain, the 10-kb libraries were constructed, quantitated, and sequenced on the two SMRT cells of PacBio RS II at the Interdisciplinary Center for Biotechnology Research (ICBR) at University of Florida. These reads were assembled into three contigs using an optimized PacBio pipeline, HGAP2 . As suggested by a PacBio HGAP instruction for bacterial assemblies, the parameter of “Target Coverage” was changed from 30 to 15. One short contig was discarded due to low coverage of PacBio reads. Two remaining contigs were merged into a single contig with Illumina assembled contigs using the minimus2 module in AMOS (sourceforge.net/apps/mediawiki/amos). The contig was further circularized through removing the overlap at two ends. To improve the quality of the draft assembly at the ends of the contig, a standard PacBio resequencing pipeline with PacBio reads was used for additional error correction. 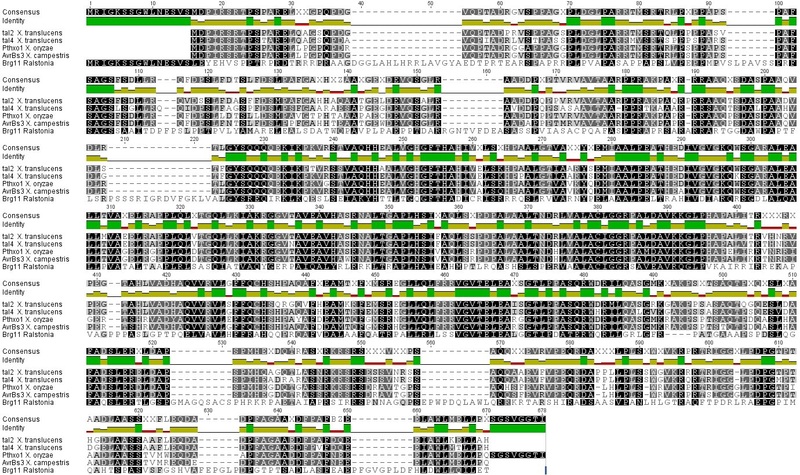 Trimmed Illumina reads were aligned to the assembly sequences with BWA-MEM . The alignment was subjected to stringent filtering criteria (minimum mapping score: 40; minimum overlap: 100 bp; minimum identity: 97; and minimum read coverage: 98 %) to obtain a set of uniquely and confidently mapped reads coverage. To identify mismatches between Illumina sequencing data and the assembly genome, GATK was applied to discover SNPs and INDELs [50, 51]. A set of criteria for polymorphism filtering, including a minimum polymorphic site coverage set as five reads and minimum percentage of reads of the polymorphic allele set at 90 %, were used as the filter to identify the mismatches between Illumina sequences and the assembled genome. The finished assembled genome of XT4699 was annotated using the NCBI Prokaryotic Genome Automatic Annotation Pipeline (PGAAP) (ncbi.nlm.nih.gov/genome/annotation_prok). The annotated genome has been deposited in Genbank with accession number (CP_008714). The complete and draft genomic sequences were also annotated using the RAST (Rapid Annotation using Subsystem Technology) (http://rast.nmpdr.org) . The sequence feature of TTCGN16TTCGN, where N represents A, T, G, and C, was used to search the 500-bp promoter region before each annotated gene to identify genes with the plant inducible promoter (PIP) element. IS elements of XT4699 genome was annotated by ISfinder (www-is.biotoul.fr) . Multilocus sequence analysis (MLSA) was used to build phylogenetic trees in Xanthomonas strains . To generate the phylogenetic relationship tree, concatenated sequences of four conserved loci (dnaK, gyrB, groEL and recA) were assembled. The distance matrix was constructed with the Tamura-Nei genetic distance model and the tree was built using the Neighbor-joining method in the Geneious software R6, with sequence of Stenotrophomonas maltophilia K279a as outgroup. Whole-genome discovery of single nucleotide polymorphisms (SNPs) was performed by using the assembly draft or finished assembly sequences with MUMmer 3.0 . The modules of nucmer, delta-filter, and show-snps were sequentially run to identify SNPs. At least 100 bp and 90 % identity of one-to-one match was required for the alignment between each assembled sequence and the XT4699 reference genome. After identifying all the SNPs of each strain, the XT4699 reference genome was modified at all the SNP sites to polymorphic bases. The resulting modified XT4699 sequence was used as the reference for the second run of the SNP discovery. Consequently, a matrix of the genotyping result of all the strains was obtained. The genotyping data at the SNP sites with no missing data were used to construct a phylogenetic tree using an R package APE . A combined resource of Type III effector (T3E) in the genus of Xanthomonas, also called Xop effectors, was used as blastp query against the NCBI and RAST annotation protein database of XT4699 [1, 8, 9, 56]. The cutoff e-value was set as 1e-10. For other X. translucens strains, the same query was applied using blastp against the RAST annotation database of each strain. In the second round of identification of T3Es, the same query was applied against genome sequence of each strains using tblastn to identify T3Es, which may be overlooked by annotation process. This tblastn search was also used to confirm the presence, absence and number of copies and frameshift mutation of T3Es in the genome. Assembled contigs with less than 5x sequencing coverage, which might contain relatively high sequence errors, were excluded. Frameshifts in T3Es were identified when multiple reading frames from different segments of a contig were matched to the separated regions of a protein. Premature termination codons were identified when translation was truncated. The missing proteins overlooked by the annotation but identified by tblastn were re-evaluated by performing blastp in the NCBI protein database. Genomic DNA manipulation was performed according to standard protocols . Genomic DNA of X. translucens strains was completely digested by BamHI (New England Biolabs, MA). The digested DNA was separated in 0.9 % agarose gel via electrophoresis at 4 °C at 40 Volt overnight. The sphI fragment of TAL effector gene in X. oryzae pv. oryzae strain AXO1947 was used as the probe. AlkPhos Direct Labeling and Detection System with CDP-Star Kit (GE healthcare) was applied for the probe labeling, hybridization and detection procedures. A hrcC − mutant of XT4699 was generated by gene transfer and homologous recombination of a mutant copy. The partial fragment of hrcC gene were amplified by PCR with primers XTThrcC-F and XTThrcC-R (Additional file 20: Table S7) and cloned into suicide vector pKNOCK-Km vector . The suicide vector with cloned fragment was transformed into E. Coli S17–1 pir strain for bacterial conjugation. The mixture of XT4699 and S17–1 strains was plated on NA at 28 °C for 24 h, then transferred to TSA plates containing 20 ug/ml Cephalexin and 50 ug/ml kanamycin for selection of XT4699hrcC − mutants . The mutants were validated by PCR with primers XTThrcC-Out and 07KM-Val. The TAL mutants of XT4699 were generated in similar way. Partial fragment of N-terminal region of each TAL effector gene in XT4699 was individually amplified by PCR with primers 4699 N-TAL-F and 4699 N-TAL-R. The partial fragment was cloned into pKNOCK-Km vector for conjugation. Mutants were validated by PCR with specific primers located upstream of each TAL gene and the reverse primer Forall-Val in the vector (Additional file 20: Table S7). Two-day old Xanthomonas cultures were scraped off the TSA plates and resuspended in sterilized water. For pathogenicity type assays, bacterial suspensions (OD600 = 0.2) were infiltrated onto same age leaves of wheat and barley plants by needleless syringe. Hexaploid wheat cultivars ‘Chinese Spring’, ‘Jagger’, ‘Hope’ and ‘Canthatch’, one Triticum turgidum wheat (accession number 107 in WGRC at KSU), ‘KS Southeast’ and ‘Morex’ barleys were applied. The symptoms were observed and photographed at 4DPI. For dip inoculation assays, second leaves of 14-day-old ‘Chinese Spring’ wheat plants were dipped into the bacterial suspensions (OD600 = 0.2) coated with 0.02 % Silwet L–77. The water soaking symptoms appeared at 4–5DPI and were photographed at 8DPI. For bacterial growth population assays, equal amount of inoculum of 4 × 104 dilutions of original bacterial suspension (OD600 = 0.25) was infiltrated on 2nd leaves of 3-week-old ‘Chinese Spring’ wheat plants by needleless syringe. At 6DPI, three biological replicates of inoculated leaves (3 cm) were pooled and ground together. Ground samples were serially diluted, and 100 μl of diluted samples were added onto TSA agar plates for colony counting three days later. 10–100 colonies per plate is considered as optimal and three plates were applied for calculating colony forming units (CFU). Fully expanded leaves of 10-day-old ‘Chinese Spring’ wheat plants were inoculated with three different bacterial suspensions (XT4699, XT-Rocky and XT4699hrcC − ), each at an optical density of 0.5 at 600 nm, using a needleless syringe. RNA samples were isolated 24 h after inoculation using Trizol reagent (Invitrogen) as described by the manufacturer. Three biological replicates, each of which was pooled from three independently inoculated leaves, were used for each treatment. RNA quality was assessed using an Agilent 2100 Bioanalyzer (Agilent Technologies). Processed samples were hybridized to GeneChip Wheat Genome Array (Affymetrix) at Integrated Genomics Facility at Kansas State University. MAS5 algorithm normalization was applied using Affymetrix default parameters. Microarray analyses were performed with the Bioconductor/R package Limma . Linear models and empirical Bayes methods were used for statistical tests of differential expression . The comparisons were as follows: XT4699 vs XT4699hrcC − and XT-Rocky vs XT4699hrcC − . The P-values of all probes were subjected to multiple tests correction to estimate false discovery rate (FDR) . Probes were considered differentially expressed if they had an adjusted P-value <0.05 and a fold-change greater than two. Raw and processed data are accessible from Gene Expression Omnibus (http://www.ncbi.nlm.nih.gov/geo) with accession number GSE73757. All probes were annotated using Blastx analysis (E-value < e-30) against the GenBank nonredundant protein database. A few probes of interest, which show low p-values, were manually annotated. For qRT-PCR, 1 μg RNA samples were treated with DNaseI following the protocols provided by Invitrogen and subjected to reverse transcription reaction using iScript cDNA synthesis kits (Bio-rad). 10x diluted samples of the cDNA products were applied for real-time PCR in the CFX-96 machines at the Integrated Genomics Facility at Kansas State University. Relative gene expression level was calculated with 2-∆∆Ct method . The EF-1α gene was set as an internal control gene. Primer sequences are shown in the Additional file 20: Table S7. The complete genome sequence of X. translucens pv. undulosa XT4699 and its annotation are accessible in Genbank under the accession number CP_008714. The raw PacBio and Illumina reads of XT4699 were also submitted to Genbank Sequence Read Archive (SRA) under the BioProject number of PRJNA248137. The datasets of raw Illumina sequencing reads and draft genome assembly sequences of nineteen additional X. translucens strains were submitted to GenBank under the BioProject number of PRJNA302486. The raw and processed microarray data are available from Gene Expression Omnibus with accession number GSE73757. Additional files 1, 2, 3, 6, 12, 16, 20: Tables S1-S7 and Additional files 4, 5, 7, 8, 9, 10, 11, 13, 14, 15, 17, 18, 19: Figures S1-S13 are included in Additional files. We thank Haiyan Huang and Kim Park for technical assistance. We thank Dr. Yanni Lun for performing microarray experiments and Hanquan Liang for Illumina sequencing in the Integrated Genomic Facility at Kansas State University. We thank Interdisciplinary Center for Biotechnology Research (ICBR) at University of Florida for PacBio sequencing. We thank Dr. Sunghun Park for providing experimental support. We thank Dr. Bikram Gill for providing wheat seeds. This research is supported by National Science Foundation research award IOS-1238189. ZP, FFW and SL designed the study and wrote the manuscript. ZP, YH, JX, NP, AA, FFW and SL contributed to data analyses. ZP and YH performed the experiments. JJ and ZL provided X. translucens strains collected from Canada and North Dakota, respectively. AA and ZL assisted in revising manuscript. All authors read and approved the final version of the manuscript.